The sometimes erratic location reporting in Google Latitude is interesting, not least because I like to think about possible measures of consistency for the time-location pairs that it generates. This week produced a good example of a dodgy location report that should have been eliminated. I was at Sydney airport for several hours prior to the late departure of my flight to Johannesburg on Tuesday. My location was logged correctly inside the airport many times, including at the departure gate, the last time at 09:54. 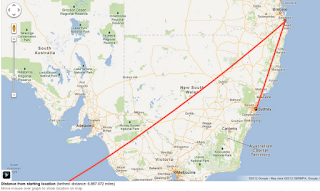 There was one more timestamp inside Australia, at 10:08 after which the next recorded location was roughly 15 hours later in Johannesburg. 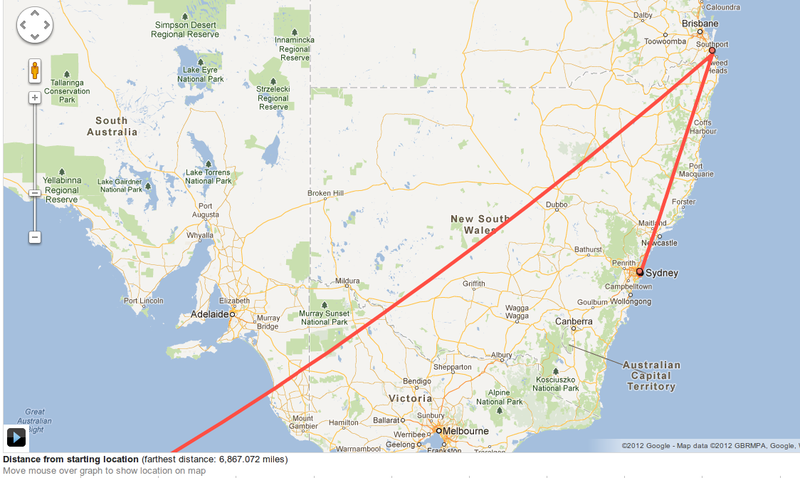 The last Australian location however, was near Brisbane, more than 1000 km from Sydney! Now, except for NASA, no-one can get from Sydney to southern Queensland in 14 minutes so this timestamp is obviously inconsistent. Furthermore, the fact that it was followed by 15 hours of nothing would make it a very solid candidate for discarding. I am quite sure that the reason for it was a mobile WiFi hotspot (possibly on a mobile phone just arriving from Queensland) the location of which Google had mapped in Queensland. I have observed similar problems in South Africa with mobile WiFi devices but surely a bit of data processing could really improve things quite a bit!